Get Battlefield 1 and 4 DLC for FREE in the latest “on the house” promo by Origin and Electronic Arts. 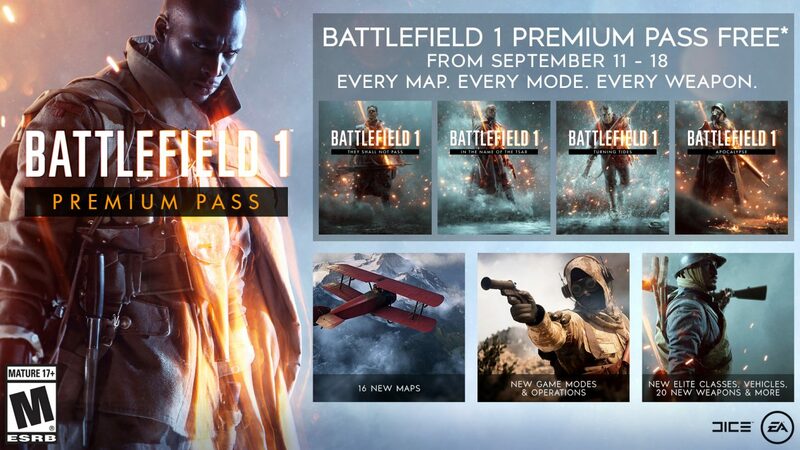 During this week, September 11th to 18th, you can get Premium Packages for both Battlefield 1 and 4 completely free. No catches. Premium packages include new maps, new game modes, new Operations, new Elite classes and more. For Battlefield 1 premium package, go here, and for Battlefield 4 Premium Membership head over here. Just add them to your account and keep them forever. You need to have base Battlefield games and a free Origin account to enjoy the free mayhem offered here. Don’t have a base game? You can still get the premium packages now, and if you buy Battlefield 1 and/or 4 in the future, you can use the DLC packs for free!